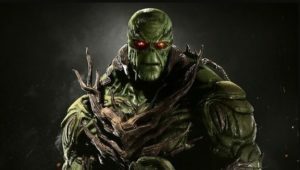 This page contains a character guide for Swamp Thing in Injustice 2. Here you’ll find movelists, combos, juggles and strategy guides and recommended gear for the Hero character. For more Injustice 2 content, head over to our Injustice 2 top page. Swamp Thing is an elemental creature who shares a connection to all plant life on the planet Earth through a network called the Green. He is a mass of vegetable matter that absorbed the memories and personality of Alec Holland, a botanist who died in a swamp shortly after creating a hormonal Bio-Restorative Formula for plants. Meter Burn R2 (Must press R2 at any time during Green Thumb. Meter Burning Green Thumb will give Swamp Thing health back). Opponents cannot dash or jump while being caught in Abigail’s Garden. The opponent will take damage over time from Abigail’s Garden. Stops Abigail’s Garden from growing but leaves a patch of Wildflowers on fightline. Causes Abigail’s Garden to instantly wither away. Below are combo and juggle inputs for Swamp Thing, including corner strategies and restarts.